The EverLine Coatings Toronto office provides asphalt sealcoating and crack filling services that will ensure that you not only prevent the need to repave, but you extend the value of your original investment considerably. At EverLine Coatings and Services, we the industry’s best asphalt sealcoating and crack filling services in Toronto. Sealing cracks in the surface of your asphalt is very important. If a crack or hole is left unrepaired and unsealed, water can seep into the surface and cause more damage and cracking to occur. At EverLine, we can seal your surface by spraying an asphalt-based waterproofing material on the surface of your asphalt. Asphalt crack filling is the process of filling cracks in your asphalt surface to prevent water from seeping in and any further water deterioration. If cracks in the surface of your asphalt are not repaired, they have the potential to turn into potholes. Studies show that up to 75% of untreated cracks in the pavement or an asphalt surface eventually turn into potholes if water damage occurs. Water damage is entirely preventable with the right maintenance. At EverLine Coatings and Services, we can help maintain your surface by completing the needed repairs to ensure the longevity of your pavement. Committing to a yearly crack filling and maintenance routine is the best way to protect the investment that you have made in the asphalt around your home, business, building, or property. EverLine Coatings and Services proudly provides the best asphalt repair services in Toronto to keep your asphalt services looking great for years to come. EverLine Coatings and Services has established itself as one of the top sealcoating and crack filling companies in Canada. This is apparent with every asphalt repair in Toronto. At EverLine, we do not thin our products. We apply our sealcoating and crack filling products according to manufacturer specifications to ensure that every asphalt repair will have great longevity and to ensure that your surface lasts as long as possible. EverLine’s highly trained sealcoating and crack filling crews consist of the best paving contractors in Toronto. Another big part of what makes an EverLine crack filling or sealcoating repair better than the repairs of our competition is our thorough preparation process. At EverLine Coatings and Services, we go the extra mile to ensure that all cracks and surfaces that we repair have adequately been cleaned out and that the ground is free of dirt or debris before we begin any repairs. Our thorough preparation process ensures that our crack filling and seal coating applications are effective and last a lot longer than the repairs of our competitors. To ensure that we always provide the best value possible to our clients, we always apply two full layers of sealcoating. At EverLine, we want your surface repair to last longer than anyone else’s. We only carry products that are made to endure our harsh Canadian winters and the weather we have here in Eastern Canada. EverLine is proud to be one of the best asphalt repair companies in Toronto. Between the years of asphalt repair experience and rigorous training programs, our Toronto paving crews have under their belt, they have earned the title of being the asphalt sealcoating and crack filling experts in Toronto. Our asphalt sealcoating crews have worked on all different kinds of properties and asphalt driveways in Toronto. In their years of experience, they have seen and done it all in the past. At EverLine Coatings and Services, we are wholly committed to continually educating our crews with the latest and greatest innovations in the asphalt sealcoating and crack filling industry. Our crews have been trained with the latest technology, equipment, products and application techniques to ensure that they can deliver the best quality with every project that they complete. When you hire EverLine Coatings and Services for your crack filling and sealcoating services, you can expect your repair to be completed promptly with professional results that will exceed your expectations every time. Our services make your surface look and feel like it is brand new again. Sealcoating and crack repairs also minimize the environmental impact that your surface has versus repaving or resurfacing your surface in the long run. Our asphalt repair and maintenance in Toronto can also save your business a considerable amount of money over the cost of repaving the surface as well. EverLine’s asphalt repair services are the best way to protect your surface or asphalt driveway in Toronto. There are a few steps you can take before our asphalt sealcoating and crack filling crews arrive. 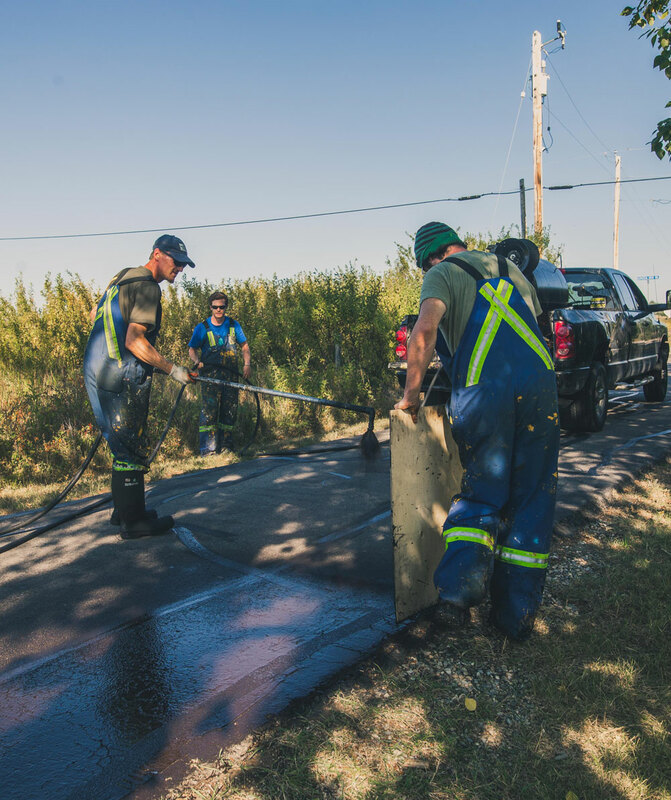 If you can prepare your surface for our crews, it will ensure that they can deliver their asphalt repair services efficiently and effectively. Properly preparing your surface ensures that we can provide our services within a short timeline. Clear the surface of all the vehicles and objects or as many as possible. Ensure your surface has been cleared of all debris. Have your asphalt surface swept clean. If your business requires parking lot cleaning services before a repair, EverLine’s parking lot cleaning services can help prepare your lot, property or surface for an asphalt repair. Given that asphalt surfaces are unique and can be in different states of deterioration, we price every asphalt repair project in Toronto on a per job basis. We analyze the difficulty of the repair project, the traffic in the area, and the amount of materials that will be used on site. Every project is unique and should be treated as such. This is why EverLine does not offer a flat rate price for its asphalt sealcoating and crack filling projects. We have years of experience working with different budgets and always deliver results that will exceed your expectations. To get a quote on our asphalt sealcoating or crack repair services in Toronto, please contact us for a free quote.